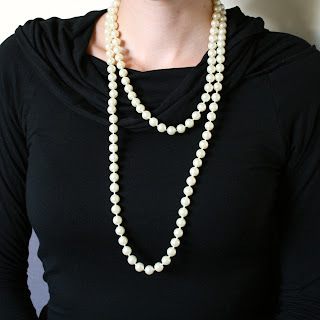 la vie DIY: Downton Abbey Style Two: 7 ways to wear those pearls! 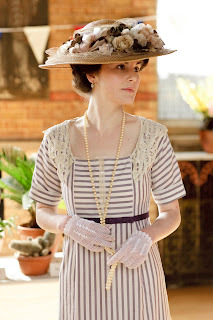 Downton Abbey Style Two: 7 ways to wear those pearls! Who is ready for more early 1900's goodness? I love it all. Often on the show (and in that time period) you would see a nice, long strand of pearls. We're talking super long- the longer the better. I went to Goodwill and got this massive strand for $1.99, which I thought was extremely reasonable. Based on the massive quantity available, it's safe to say that you would have luck getting a long strand at a second hand shop as well, but these are also available online. Looking at these pictures, I'm suddenly reminded of playing 'dress up' as a girl. Did anyone else wear excessively over sized clothes, heels + jewelry? I don't know if the necklaces were this long in those days or if they just *seemed* that long on my 6 year old frame. Who knows. On to the tutorial! If you've got a strand like this (or will be picking one up), here are 7 different ways to wear it and channel your inner DAS (Downton Abbey Style). Some are a few decades more modern than others. Lady Mary shows us the first way- nice and long, hanging about on the neck, these look lovely as they are. (2) Double Wrap. 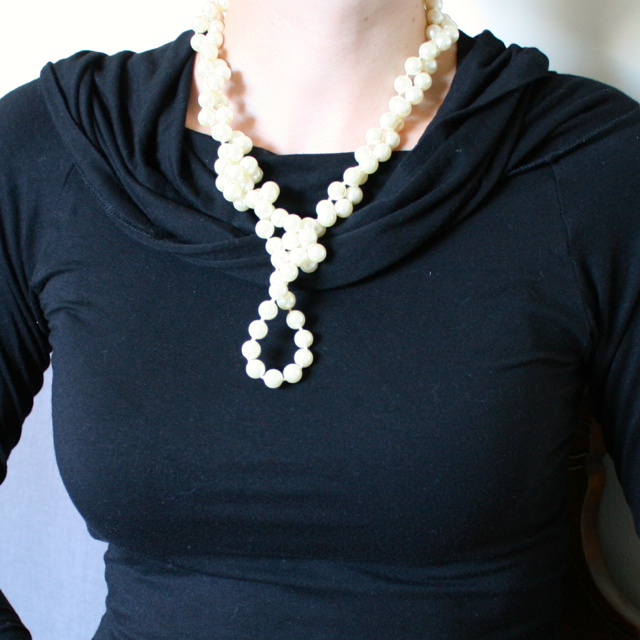 Place your strand on and then wrap once around the neck. (3) Knotted. Place your single strand on and then knot the bottom. (4) + (5) Twisted. Twist the strand tightly, finishing with each end wrapped around your index finger. Use a piece of ribbon through each hole to tie a bow, connecting the ends. I just grabbed the nearest piece of ribbon, but something lovely and with a larger width, but shorter length, would be absolutely gorgeous. You can leave the bow in front (4) or pull it around to the back (5). (6) Looped. Follow the steps for 4 + 5, only slide one end through the other hole to finish. Technically, you're supposed to hang a very large charm or cameo from that loop, but I don't have any. This is very "heart of the ocean" from Titanic. (7) Bracelet. Loop around your hand until there isn't any strand left! A lovely, chunky bracelet. I love pearls. Lets just get it out there. My mom has been giving me lovely strands (and my grandma, too!) since I was a little girl, but I rarely have the opportunity to wear them. I need to make more of a habit out of it. To be honest, I often skip jewelry in general (including my wedding band- which is why I dig the tattoo). I love jewelry, it's just a matter of laziness. Anyway- what's up with September weather? In the morning... frigid. In the afternoon... sweltering hot lava raining from the sky. I do not understand. I hope you're having a good week, all the best and as always, thanks for reading! How many fantastic ideas, with only one item! great work! LOVE this!! 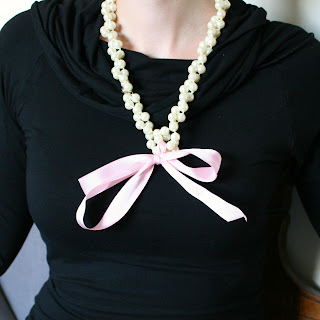 I have a strand of pearls I adore wearing as well, but never thought to mix it up like this. I especially love the twist w/ ribbon. Thanks for posting! Oh good!!! Enjoy them and thanks for reading!! Oh how cool! I love the knotted necklace idea!